Palau International Ship Registry has become the fastest growing flag in the shipping world with an impressive 43.2% growth in the number of vessels joining the registry since 2013 according to Fairplay magazine (Oct 2017). Now and everywhere – Worldwide Network Deputy Registrar Offices and more than 100 Flag State Surveyors are at your service. We strive to be at the forefront of servicing our Customers. Our worldwide Network offers local presence of Deputy Registrars and Flag Inspectors distributed throughout the major ports of the world in order to provide the required tailor made and real value added services to our clients. We are everywhere with time and flexibility as the key. Quite simply, we are always there when clients need us. With a significant investment we have independently developed and published our own SMART Database. Palau International Ship Registry is established and designed to redefine the Ship Registration service as it is time for a next generation of Smart Electronic Flag (SEF). PISR is built on Information Technology and software systems, by bringing together the best of our deep thinking and experience and together with the technology implementation we meet the customers’ needs in all aspects of their business. We are here to assist you in registration and technical matters and to earn your loyalty and trust; to understand your business, because we are Customer oriented. We put ourselves at the rudder of your ship, in order to solve the problem to your satisfaction. We believe that customers don’t care how much you know until they know how much you care. It is fundamental to identify potential risk. We are here not only to expertly offer a practical solution, but also to ensure you that your business is secure and to give you confidence in the technical condition of your fleet. PISR has been approved by BQC to the standards of ISO Anti-Bribery 37001:2016, with long-standing commitment to doing business with integrity, avoiding corruption in any form, including bribery, and complying with the applicable anti-corruption laws. It is because we want you as our Loyal Customers. And Loyal Customers don’t just come back, they don’t simply recommend you, they insist that their friends do business with you. And it is our honor to be here for you! Palau International Ship registry differentiates by innovation, as is the first Flag in the world that fully implemented a Customer Advocacy Program (CAP). The program consists from three tier levels; Silver, Gold and Platinum. Earning more tier points helps the customer to reach the next membership tier, while points can be exchanged to earn benefits. Building up the tier status from Silver to Platinum will give access to the customer to a wider range of promotions, services, and benefits. Tell us about PISR! An unsatisfied Customer is always a huge opportunity for improvement. This is our mission – to become your outstanding Reliable Maritime Partner! Tell us your opinion! We are conscious for the sound operation of your vessels! PISR designs, develop and implement sophisticated Software systems to facilitate workflow, to deliver ultimate quality to customer. 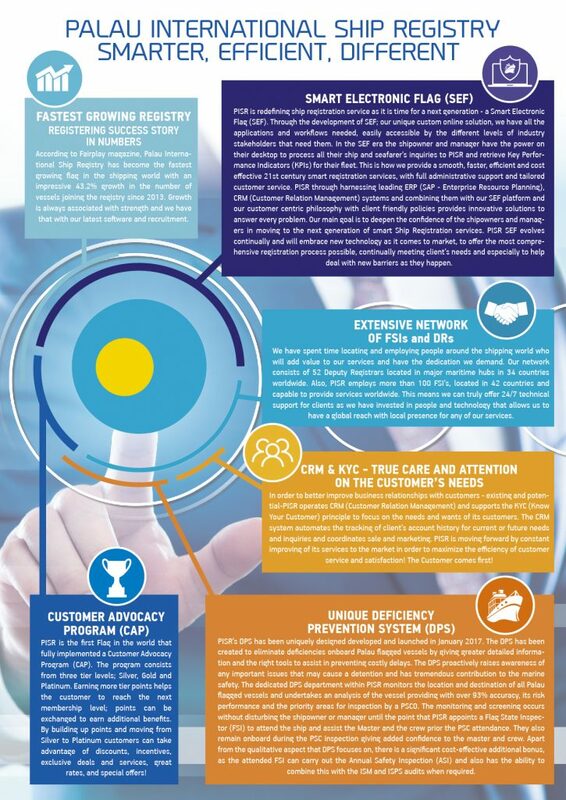 Prime differentiator of PISR is the Deficiency Prevention System (DPS), uniquely designed and developed by Palau International Ship Registry and launched in January 2017. The installation of leading ERP (SAP – Enterprise Resource Planning) and CRM (SalesForce – Customer Relation Management) systems and their integration with our (SEF) Smart Electronic Flag custom made solution, implements a customer centric philosophy and a client friendly policy to provide innovative solutions to every problem. Register with us today! Looking for a change means growth and development. Our offices, located across the world, offer a global reach and truly local presence. Request your Economical Offer HERE.